A private yacht or a family-friendly charter yacht can provide a fantastic base for a vacation. If you want to add an extra element to your vacation then some of the world’s best kids’ clubs can provide exciting activities and unforgettable experiences for your children. Here are some of the best kids’ clubs by the sea if you fancy adding an extra dimension to your family trip: 1. 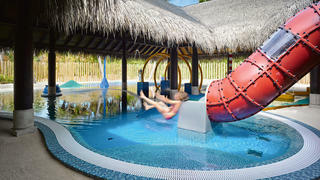 The The Jean-Míchel Cousteau Resort The Jean-Míchel Cousteau Resort's Blue Club for kids offers an award-winning program of watersports, educational games, exploring the islands and fun activities to keep children aged between six and twelve years old entertained. Those under five years old will be assigned a dedicated 'nanny' throughout their vacation on at the resort, meaning parents can enjoy the freedom to enjoy excursions, spa treatments and watersports without having to worry. A private yacht or a family-friendly charter yacht can provide a fantastic base for a vacation. If you want to add an extra element to your vacation then some of the world’s best kids’ clubs can provide exciting activities and unforgettable experiences for your children. The Jean-Míchel Cousteau Resort's Blue Club for kids offers an award-winning program of watersports, educational games, exploring the islands and fun activities to keep children aged between six and twelve years old entertained. Those under five years old will be assigned a dedicated 'nanny' throughout their vacation on at the resort, meaning parents can enjoy the freedom to enjoy excursions, spa treatments and watersports without having to worry. Located on its own private island Jumby Bay, a Rosewood Resort, is a picturesque wonderland for children to explore with white beaches, calm waters and even a flock of sheep. The headquarters for the Rose Bud programme, aimed for three- to 11-year-olds, is the children’s pavilion which provides a series of exciting experiences — including a Pirates of the Caribbean adventure and Little Chefs sessions. Children are also given the opportunity to take part in the island's conservation efforts with the Hawksbill Turtle Programme. Under expert supervision, young guests can watch turtles nesting on Pasture Bay Beach and participate in the release of hatchlings. If you are looking to enjoy some pampering with your children then you can all head to the Sense Spa. One of the best luxury spas in the Caribbean its junior menu offers mini manicures, pedicures and massages as well as hair braiding. Located on its own private island Jumby Bay, a Rosewood Resort, is a picturesque wonderland for children to explore with white beaches, calm waters and even a flock of sheep. The headquarters for the Rose Bud programme, aimed for three- to 11-year-olds, is the children’s pavilion which provides a series of exciting experiences — including a Pirates of the Caribbean adventure and Little Chefs sessions. Children are also given the opportunity to take part in the island's conservation efforts with the Hawksbill Turtle Programme. Under expert supervision, young guests can watch turtles nesting on Pasture Bay Beach and participate in the release of hatchlings. If you are looking to enjoy some pampering with your children then you can all head to the Sense Spa. One of the best luxury spas in the Caribbean its junior menu offers mini manicures, pedicures and massages as well as hair braiding. The brand-new resort has a wonderful family offering, meaning you can whisk your brood slightly off the beaten track for your next vacation. It has a pirate-themed kids' club as well as a teen club with its own pool and dedicated menu, as well as daily supervised activities so your little ones will be fully entertained for the duration of the trip. Additionally, if you're after a romantic dinner for two one night, they offer babysitting services on request. During the day families can partake in a variety of water sports, including scuba diving, surfing, kayaking and much more at the nearby beach, but for a more relaxed day, parents can unwind in the sunshine while their children play in the multi-level swimming pool. The brand-new resort has a wonderful family offering, meaning you can whisk your brood slightly off the beaten track for your next vacation. It has a pirate-themed kids' club as well as a teen club with its own pool and dedicated menu, as well as daily supervised activities so your little ones will be fully entertained for the duration of the trip. Additionally, if you're after a romantic dinner for two one night, they offer babysitting services on request. During the day families can partake in a variety of water sports, including scuba diving, surfing, kayaking and much more at the nearby beach, but for a more relaxed day, parents can unwind in the sunshine while their children play in the multi-level swimming pool. If you are heading to the Maldives with your family then it’s hard to beat the bespoke service of the Lha Velaa Kids Club on Velaa Private Island. 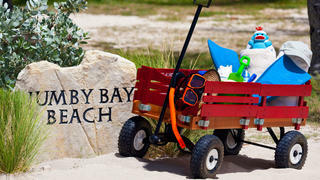 Each child is met on the jetty upon arrival and has one staff member that looks after them throughout their stay. The island is equipped with fabulous facilities for children— including the largest water park in the Maldives and a climbing wall - while activities range from kids’ yoga to learning about sea life with a marine biologist. There is plenty to keep teenagers entertained including SeaBob scooters, diving excursions, PADI certification courses, kayaking, sailing and kite surfing. There is also an array of experiences to enjoy as a family including sunset cruises, fishing and dolphin watching. If you are heading to the Maldives with your family then it’s hard to beat the bespoke service of the Lha Velaa Kids Club on Velaa Private Island. Each child is met on the jetty upon arrival and has one staff member that looks after them throughout their stay. The island is equipped with fabulous facilities for children— including the largest water park in the Maldives and a climbing wall - while activities range from kids’ yoga to learning about sea life with a marine biologist. There is plenty to keep teenagers entertained including SeaBob scooters, diving excursions, PADI certification courses, kayaking, sailing and kite surfing. There is also an array of experiences to enjoy as a family including sunset cruises, fishing and dolphin watching. The latest addition to the top luxury hotels in the Mediterranean, Miraggio Thermal Spa Resort’s Kids Planet offers entertainment for children from three months to 17 years old. 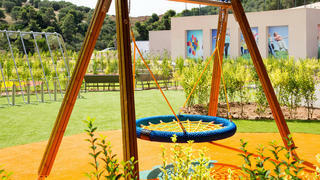 Its extensive facilities include an impressive football academy and kid’s radio station. 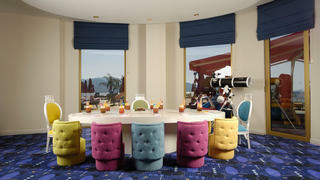 The resort also offers a wide range of activities such as pirate battles and astronomy. Set to become one of the best hotels to visit by superyacht, a new marina has opened alongside the 5-star spa resort in Halkidiki making it an easy stop off this summer. The latest addition to the top luxury hotels in the Mediterranean, Miraggio Thermal Spa Resort’s Kids Planet offers entertainment for children from three months to 17 years old. 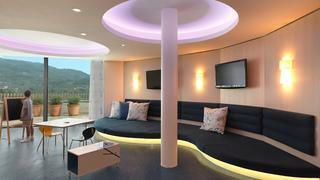 Its extensive facilities include an impressive football academy and kid’s radio station. 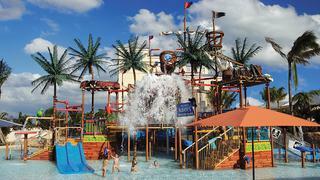 The resort also offers a wide range of activities such as pirate battles and astronomy. Set to become one of the best hotels to visit by superyacht, a new marina has opened alongside the 5-star spa resort in Halkidiki making it an easy stop off this summer. Nestled in the Zeytinlikahve Cove Jumeirah Bodrum Palace is home to the Sinbad's Kids Club which features a children’s pool, aqua park and playgrounds. One special feature is the Science Club which gives children over the age of eight the chance to be introduced to science in a fun way. Children can conduct experiments and use professional microscopes while teens can make their own eco toys, such as cars and robots, which run on solar energy. Parents with younger children can take advantage of the Baby Room which has been specially designed for children under four. Nestled in the Zeytinlikahve Cove Jumeirah Bodrum Palace is home to the Sinbad's Kids Club which features a children’s pool, aqua park and playgrounds. One special feature is the Science Club which gives children over the age of eight the chance to be introduced to science in a fun way. Children can conduct experiments and use professional microscopes while teens can make their own eco toys, such as cars and robots, which run on solar energy. Parents with younger children can take advantage of the Baby Room which has been specially designed for children under four. 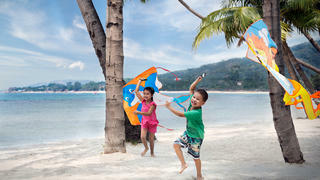 The family orientated Manathai Koh Samui has designed its kids’ programme around allowing children to interact with and explore Thai culture. Children will have the opportunity to take part in Thai cooking, dancing and yoga as well as having a go at learning the language. There is also the option for them to have a go at Muay Thai Boxing, with participants receiving a certificate and embroidered Muay Thai shorts. “A lot of thought has gone into this programme to ensure it ticks all the boxes in terms of finding the perfect balance between high octane fun and learning activities,” says general manager Natalie Kamolwattanasoontorn. The family orientated Manathai Koh Samui has designed its kids’ programme around allowing children to interact with and explore Thai culture. Children will have the opportunity to take part in Thai cooking, dancing and yoga as well as having a go at learning the language. There is also the option for them to have a go at Muay Thai Boxing, with participants receiving a certificate and embroidered Muay Thai shorts. “A lot of thought has gone into this programme to ensure it ticks all the boxes in terms of finding the perfect balance between high octane fun and learning activities,” says general manager Natalie Kamolwattanasoontorn. Offering stunning views of the UNESCO-protected islet of Spinalonga, Domes of Elounda has recently completed a multi-million pound expansion and launched Domesland — a specially designed entertainment area and programme for children and teenagers. It has a vast array of watersports on offer including tubing, water skiing, beginner scuba instruction and paddle boarding. While activities on dry land include treasure hunts, sandcastle building, arts and crafts, mini bikes and cars, puppet shows, bowling and tennis. The resort also offers an extensive children’s spa treatment menu, which includes chocolate facials and “mummy and me” pedicures. Offering stunning views of the UNESCO-protected islet of Spinalonga, Domes of Elounda has recently completed a multi-million pound expansion and launched Domesland — a specially designed entertainment area and programme for children and teenagers. It has a vast array of watersports on offer including tubing, water skiing, beginner scuba instruction and paddle boarding. While activities on dry land include treasure hunts, sandcastle building, arts and crafts, mini bikes and cars, puppet shows, bowling and tennis. The resort also offers an extensive children’s spa treatment menu, which includes chocolate facials and “mummy and me” pedicures. As part of the VIK (Very Important Kid) programme at MAIA, a butler is provided to help take care of your children when required so you can relax and enjoy the resort. The diverse range of activities on offer include swimming lessons, sand castle building, treasure hunts, canoe trips, arts and crafts and night-time film showings. If your little someone also likes a touch of pampering the Spa offers a chocolate fudge or banana-split scented bath, massages, mini-pedicures and mini-manicures. 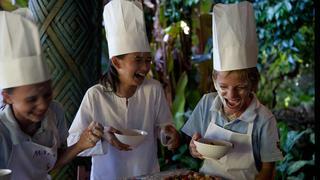 Designed to touch on all five senses the kids' program at Panacea Koh Samui immerses children in Thai culture. Children are able to learn to cook authentic Thai cuisine, explore a butterfly garden, discover traditional Thai music and create their own scent from essential oils. With Thailand now becoming more accessible due to its new foreign-flagged charter licenses Panacea Koh Samui is worth a visit if you are in the area with your family. 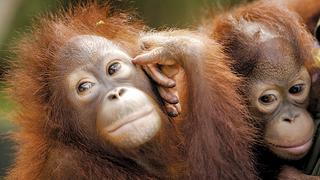 The resort-established Rasa Ria Nature Reserve, which aims to rehabilitate and release endangered and endemic species, offers ranger programs for children ages five to 12 and orphaned baby orangutan observation for kids ages six and older. 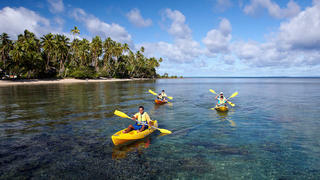 The region is one of the best destinations for research and conservation voyages if all the family want to get involved. Located on the fifth floor of the Jumeirah Port Soller, Barbaroja's Kids' Club is the perfect place for 3 to 12-year old “pirates” with plenty to keep children entertained including board games, drawing and creative activities, computer games, books and much more. Oli Nut Bay Nut House Kid's Club aims to encourage respect for the land and sea and offers age-appropriate activities for younger children, tweens and teens. Children can learn about the island’s unique flora and fauna and some of the biggest threats to the world’s oceans. 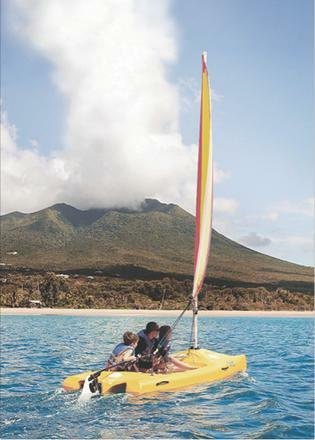 In addition to the year-round complimentary kids’ club, during summer and winter holidays, children ages five to 13 can opt for the outdoor-focused Camp Nevis, and kids ages three to nine can get closer to sea turtles in Sea Turtle Camp. This should leave you with plenty of time to play a round or two on one of the Caribbean’s most scenic golf courses. 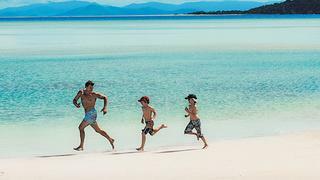 Fish feeding, wallaby spotting, crab hunts, sand flat tours and Australian art are just a few of the complimentary supervised activities offered for children ages four to 11 at this Great Barrier Reef resort. 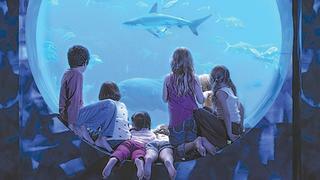 An underwater theater showcasing the marine wonders of Ambassador Lagoon, a little pirate’s playground, rock climbing walls and electronic entertainment centers keep children ages three to 12 grinning. While teenagers can practice their dance moves, enjoy a mocktail or play video games at the specially designed Club Rush. A 5,400-square-foot children’s clubhouse offers a supervised point of action for children ages 18 months and older; though, you may have to drag younger kids away from Treasure Island, the resort’s interactive water playground.